We all have them....those lonely dusty books, just sitting on the shelves of our homes, thrift stores and second hand shops. You know the ones that no longer are of use or the datebooks that are out of date, or heck, books that were just a terrible read in the first place. Well here is your chance to breath new life into their old bindings. 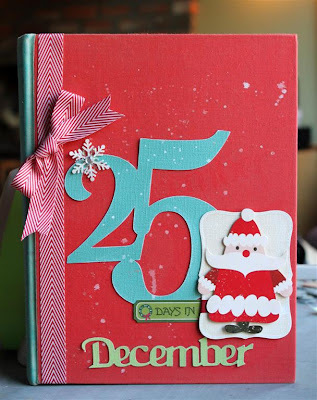 Today's Challenge is to Reuse a book, a notepad, a journal....anything and transform it into something new. Could be a hide box, could be a gift note pad, a phone book.....there are endless possibilities. The only real rule is recreate a book using Core'dinations in the most creative way you can. Don't forget to also share your creations on the facebook page so that everyone can see what you have created and leave some love!! I then used a book binding tape to cover the seam and title, you could try washi or Fabric tape too! and then I just decorated the cover. When all my pages are complete I will bind it all together....and voila, this will be my December Daily. Challenges must use the Linkinz below. If you do not have a blog, please feel free to use Photobucket or Flickr or any other photo sharing sight that provides links. Challenges must include Core'dinations ColorCore Cardstock. You may not combine this challenge with any of the other HCC challenges but you may complete this challenge as many times as you like. You must link by 8 pm, December 2nd (Sunday). Winners must email ellen_sosnoski@coredinations.com by DECEMBER 12th with your name, address, phone number and prize the won in the subject line. In this case Core'dinations Crop Core Cuts pack Winner. This is the cutest - love the big numbers! Great idea! WOW - your upcycling looks fabulous - love your colour combo too!!! Delightful new purpose for this wonderful book...great idea! Super cute! Love your journal! Had fun doing your challenge!